Once you’ve become comfortable behind a Venetian oar, why not use it to go somewhere? And what better destination than a local bàcaro…or two. If there’s anything more enjoyable the learning to row Venetian style, it’s learning to eat Venetian style. 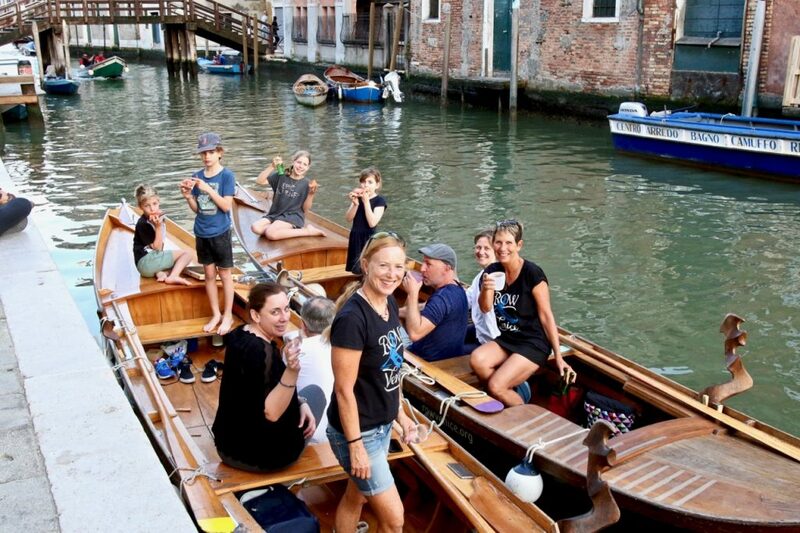 Combine the two with Row Venice’s unique Cicchetto Row, when after a lesson to hone your voga skill, you’ll meander your traditional Venetian craft to the nearest bàcaro to slake your appetite with sumptuous cicchetti and…a sparkling Prosecco sur lie, perhaps? An assortment of typical cicchetti and accompanying wines at Venice’s traditional bàcari is the perfect intro to the tastes of Venice without committing to a whole meal. These crostini concoctions are limited only by the imaginations of the proprietors who create them…and none of it will ever taste better than after a late-afternoon lesson, sipping and sampling as the sun sets, in a bella batelina that you rowed yourself. Everyone wants to eat local—though most haven’t the vaguest idea what that means. Being accompanied by a bàcaro devotèe means you might venture Venetian classics like piovra octopus, fluffy white bàcala mantecato (cooked codfish whipped with olive oil) on polenta, a savory hot polpetta meat or tuna croquet, or a speck, robiolo e tartuffo crostino…when you otherwise might pass them by. If your tastes are more conservative, don’t worry: there are plenty options for you, too). Even if you ‘normally drink red’, we’ll suggest trying out some of the most impressive regional whites in Italy…or anywhere, for that matter. (Have a exceptional passion for wine? Request one of our wine-specialist vogatrice to accompany you.) And don’t worry, non-imbibers will find plenty of non-alcoholic options to slake their thirst. While we don’t get too ‘weird’ food-wise, this activity is designed for food and wine enthusiasts. Cicchetti are prepared with a wide variety of the freshest ingredients (fish and seafood, meats, vegetables and cheeses); we can usually adapt choices to any personal dietary habits. We’re not a restaurant, however, so if your diet is exceptionally restrictive, we suggest late afternoon rowing lesson, after which we’ll point you to some nearby bàcari to sample on your own. If you have any questions, just let us know. The Cicchetto Row lesson and outing lasts 2.5 hours. Start times are Jun-Aug, 17:30; Apr-May & Sept-Oct, 11.30 and 17.30; Nov-Mar, 11:30 a.m. only (due to early sunset) anc chilly temps. The cost (rowing or riding) is €240 for two people, €260 for three, and €280 for four. Cost includes food and drinks (alcoholic or not). We also have one larger batela for groups of 5 only; the cost is €460 and you may book that directly, just choose Cicchetto Row, 5-person batela. Remember to specify any health-related dietary limitations such as allergies, celiac, etc., in the comments of your reservation.